Fútbol is a way of life in Argentina. Other sports don’t hold the allure or fervor that fútbol evokes here. Two teams dominate the media–the rivalry between River Plate and Boca Juniors. River Plate recently had the distinction of winning their league, the Clausura, title on June 8 against Los Estudiantes team. Football stars are treated like superheroes. Lionel Messi is the national fútbol hero at the moment, a deft player. Diego Maradona, the fallen fútbol phenom of the eighties, is still revered. It’s impossible to go a day without seeing his name in the news and celebrity tabloids. E. and I watched a game against Boca Juniors and team Racing in May. It was exhilarating. 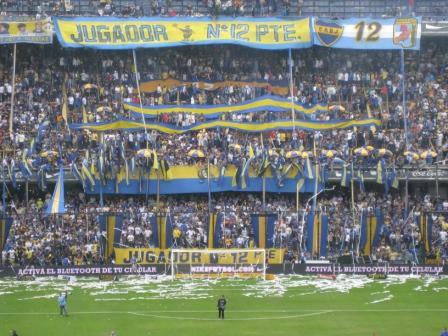 The game was held in the Bombonera stadium in La Boca. Bombonera means “Bon bon box” in español, which seems to be a nod to the revelry and indulgences held inside. Boca Juniors colors are Argentine blue and yellow jacket yellow. The stadium can be a little dangerous for girls and women. I realized tonight what our balcony reminds me of. I feel like Jimmy Stewart in Hitchcock’s Rear Window. However, in my version of the movie there are construction workers sawing all day and beagles bellowing through the evening. Tonight we can hear all of our neighbors scream when the soccer team, River Platas, makes goals. Perhaps all of these mundane descriptions will change once I purchase my binoculars.